When you were a kid it was up to your parents to make sure you followed the right path in life. Teaching you manners, presenting you accountability with chores, introducing you to sports and team work. But as soon as you move away from your nest, it's up to you to find your way. It sounds simple. But in reality it's one of the most difficult choices you'll make. And if you make a wrong turn along the way, it's okay. That's the tough one, being okay with a choice that didn't quite work out for you. Every life experience makes you up to who you are today. And who you'll become tomorrow. In the moment, however, it may bring you down. But finding that strength and courage to pick yourself up again will only make you stronger for what's to come. Life isn't easy. And would you expect it to be? If it was, we'd live a pretty boring existence. At some point, you'll come to the realization that in order to find the right path, you need to follow your passion. A passion is something that makes you breathe easy. A passion is something that you wake up to everyday and are thankful for this wonderful opportunity. A passion makes you smile. A passion will give you butterflies at first, but as soon as your realize the potential you'll be calm. A passion is a choice you make to fulfil your hearts desire. 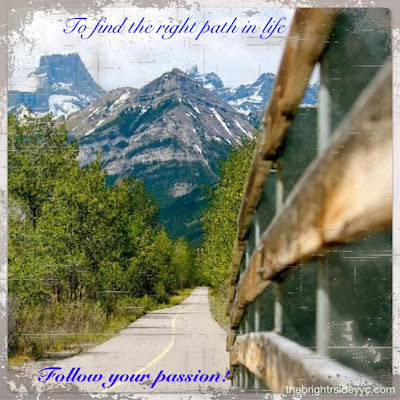 But in order to follow that path, you must discover what your passion is. Everyone has it in them. And you'll find it by listening to your heart. And once you do, your heart will smile. This photograph was taken in Kananaskis, Alberta Canada. Enjoy it's beauty.